Gas Pump Liquor Dispenser - Moar Stuff - You don't need it but you know you want it. Simply fill the tank with your favorite liquor and serve it by pumping through the hose. This great Father's Day gift will add style to any bar or liquor cabinet. The gas pump liquor dispenser is one of many unique Godinger gifts for men. The Gas Pump Liquor Dispenser by Godinger is a great way to store and dispense your favorite liquor. 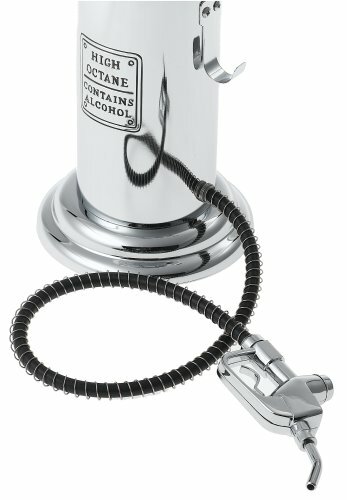 Shaped after an old-time gas pump, it holds and dispenses up to 32 oz (950ml) of your favorite whiskey, scotch, or other liquid via the attached hose and nozzle. Sure you could pour it straight out of the bottle, but why? Add some fun with this new charming retro liquor dispenser made to look like a old fashioned gas pump. It’s a great way to store your favorite liquor and is fantastic for parties, set it out on the counter and let your guests have fun making their own cocktails; Why not buy one for all your liquors so your guests can choose between different “high octane fuels”? It boasts a silver-plated base and crystal top. It has a 5.5-inch diameter and is about 19 inches tall. Just gently squeeze the handle to dispense the libations and keep the party going. It would make an awesome Father’s Day gift for a motor head and/or liquor lover. Dimensions: 19″ H x 5.5″ W x 5.5″ D.
Holds up to 32 oz (950ml).